I am entering an interesting stage with my angoras. This is the first time I’ve had bunnies molting out fiber. And a lot at once! I picked up 4 Satin Angoras from a breeder this past weekend, and all of them are losing coat! Plus my English Angora Albus is molting. This time I am attempting to pluck the fiber. using a comb and my fingers I gently remove the fiber. The plus side to this, is that the fiber is the best for spinning. The negative, is that it’s more time consuming than just shearing the fiber off. I have a hunch, I will finish part of Albus with shears. Now a properly maintained coat, will not have a lot of mats, typically you’ll see mats if you don’t start to remove the coat that is ready to shed. For that reason, checking the coat consistently is important. It’s also important for the health and comfort of the bunny. Who wants to have itchy loose hair hanging around, AND more than that ingesting that loose hair can cause hairballs which can be fatal. 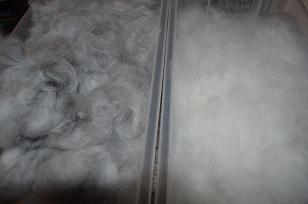 On the left is Albus’ black wool, right Princessa’s pretty white wool. Both are being stored in plastic shoebox storage boxes. Each is labeled with the bunnies’ name. So, as a result, the next couple weeks here will be spent in a cloud of fuzz. I am hoping that Pearl, and Sabrina hold their coats a little longer to enter a show at the end of the month, but if not, I’ll simply attend the show and watch. Their health and comfort is more important after all! But in the 1980’s, a Satin rabbit breeder, noticed a mutation in their rabbits. A bunny had longer than normal hair. Mrs L.P. Meyer, a long time angora fancier, was intrigued and bred the little copper bunny to a French Angora. In 1987, the ARBA accepted the Satin Angora into the show world. Satin Angoras, are still a breed that is considered a work in progress. They tend to produce less wool than their other Angora cousins, but part of that is simply because their wool is so much finer. The hair shaft is lighter, and feels almost like silk in texture. It spins beautifully into an extremely strong yarn that glows with a light. Even a white Satin Angora shimmers in the sun. The wool accepts dye readily, and is warmer than sheeps wool, soft, and lofty. No bunnies have to be harmed to produce the fiber, instead they are groomed and their coats are either sheared or plucked (where the currently shedding fiber is removed by hand), approximately 4 times a year. First is their temperament. All Angoras tend to be people rabbits who are clowns, and sweet. After all, unlike many bunnies bred strictly for meat purposes, Angoras have been bred to live a long productive life making wool. They must be easy to handle. Satin Angoras are inquisitive, a little bit more active than their English cousins, and they love people. It’s wonderful having bunnies who come up for petting and greet you at the cage door every morning. Especially when petting them is like petting silk. The next is their fiber. All Angora is a luxury fiber, but Satin Angora, is the epitome of the word. It’s silky, shiny, warm, extremely light weight, and spectacular. It is fiber fit for a king. The third reason is, the Satin Angora’s body type is a production type. This means that if you are on a small homestead, this is a triple purpose rabbit. It can provide you with clothes, compost for the garden, and meat for the table if someone so chooses (we do not choose, as we are actually Vegan, all our bunnies are pets). In today’s movement toward self sustainability, this is awesome.